For a great tartare, you have to balance the right amount of ingredients to end up with a fresh, crunchy, spicy, and creamy texture all in one bite. 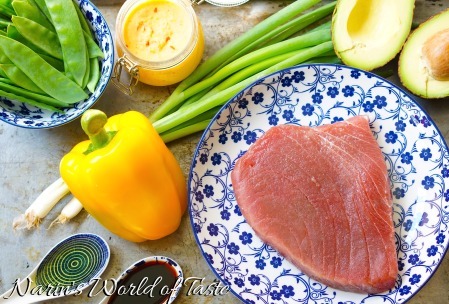 Here I combined the fresh tuna with spring onions, salty and spicy chili garlic paste, and soy sauce. 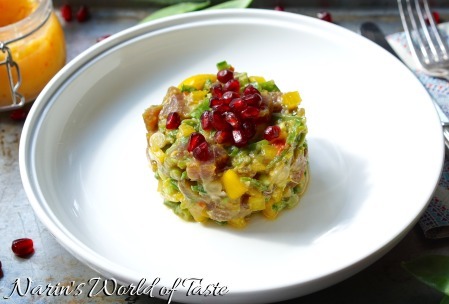 For the crunchy effect, I used snow peas, yellow pepper, and pomegranate seeds also for decoration. This combined with creamy avocado creates a well balanced deliciousness. Wash the spring onions, snow peas, and yellow pepper. Slice the spring onions, yellow pepper, and snow peas thinly. Cut the avocado in half, remove the pit, then while still surrounded by the peel, cut length- and crosswise through the flesh to create small cubes. Do so carefully so that you don’t cut through the peel, then scoop out the cubes with a spoon. Also cut the tuna into small cubes. Assuming you keep your chili garlic paste in the fridge, remove it and heat it a little so that it becomes soft. 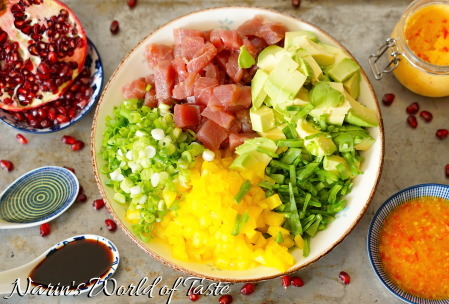 In a bowl, thoroughly mix all ingredients, season to taste with salt if needed. To serve, if you have food forming rings, this is a great opportunity to use them. Else, use a normal table spoon and arrange nicely. 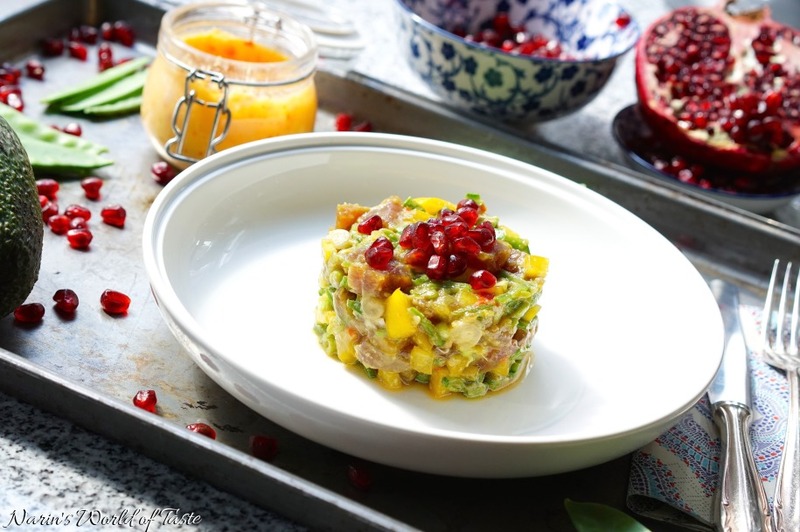 Garnish with pomegranate seeds, which will add an extra fruity and crunchy flavor to your tartare.